It is so, so important to leave at least one bulletin board empty on that first day of school. That board is just waiting for the amazing work your kids will do during that first week. Ideally, it would be a project with their names. You can find some great ones on this Pinterest board. Student pictures are great, too – time lines, collages, baby pictures, self-portraits etc. Take lots of pictures. Not just at the start of the year but all year long. Then display them in your classroom. One idea is to make a special bulletin board (or do something easy like put clothes pins on a string or piece of fishing net) just for student photos. Swap them out as often as you can. Send the old ones home with the students who are in the photos and put up new ones. This is a great job for a parent volunteer! I think this is especially important if you teach in a school where your kids might not have the best home life. It could be that no one takes pictures of them at home. Show that child that you care enough to take and post his picture. For older students, consider having a Photographer of the Week whose job is to take pictures. You, of course, get to decide which ones get printed! Cozy spaces and alternative seating are a great way to help kids feel at home. Consider lowering tables so kids can sit on the floor. Allow your wiggly kids to sit on fitness balls. Let them read in odd places, like under desks or in your super cozy Book Nook. 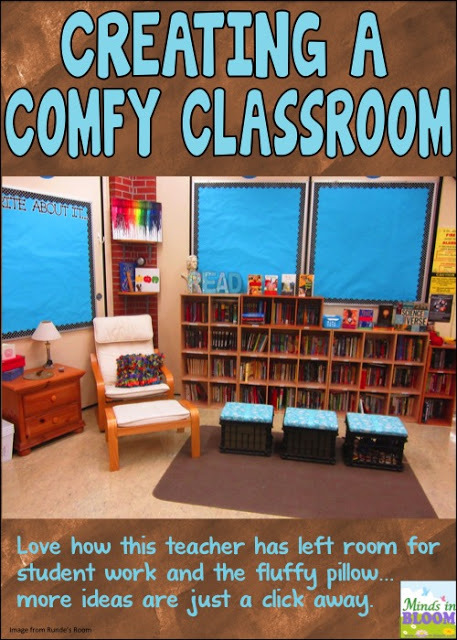 Check out this Pinterest board for some cozy classroom library ideas. Beanie Babies and other small, plush toys can be a great addition to your classroom. You can have table group mascots (or use a larger plushie for a class mascot) or let each student have his or her own small toy. These are great for classroom libraries and indoor recess! Pillows are another terrific idea, and they don’t have to stay in the library. Kids can use them to make cozy corners anywhere. And don’t forget about rugs. Big and small, fluffy rugs can make a room cozy. Fluorescent lights can be harsh all day long. Some teachers find small table lamps to use at certain parts of the day. You can put one at each table group or just set them strategically around the room. There are so many fun lamps. Target and Ikea have great ones, and, of course, there are always your neighborhood garage sales. Rice paper lanterns are another fun idea. Pick them up at Ikea or possibly the dollar store. Also consider strings of lights and those battery-powered fake candles. Consider all the senses when making your classroom feel warm and homey. Something that gives off a fresh scent (just make sure no student is allergic) like this essential oil diffuser can be a nice touch. For relaxing sounds, I have a friend who has quiet wind chimes in her room, and I had a table top fountain on the counter by the sink. You might also consider playing soft music from time to time. Special thanks to my friends on Periscope for passing along some of these fabulous ideas! Find me on Periscope @RachelLynette. Classroom Procedure Tips and a Free Checklist! Make a REAL Impact on Student Learning with Student-Led Conferences! Classroom Procedure Tips and Resources How to Deal With Class Wiggle Worms Random Acts of Kindness: One Teacher’s Amazing Plan! Loving your blog post! So many great tips! Great ideas! I am now a push-in ESL teacher who is in several rooms each day. I can tell you there are lots of differences in behavior and academic achievement based on how comfortable the classroom is. Smells, lighting, and so on make a huge change! I know sometimes teachers can't control the temperature but it makes a difference as well. I wish I had seen the difference when I was a classroom teacher.